This is a pack of 20 IrisDuo beads in Champagne Lustre. 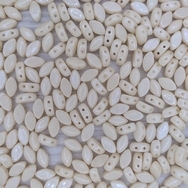 These two hole beads measure about 4mm by 7mm and were made in the Czech Republic. The Czech number for this colour is 03000/14413.